CINCINNATI – They had a news conference. We’re going to have a party. Major League Soccer announced Nashville’s franchise in an auditorium at the Country Music Hall of Fame. They’re going to announce Cincinnati’s in a craft brewery. And then there’s going to be a public celebration on Fountain Square. Expect many of the cheering, enthusiastic fans that have made up the record crowds at Nippert Stadium these last three seasons to be on the Square, wearing orange and blue and waving flags and chanting as only soccer fans do. Six months later, there’s no begrudging Nashville for getting the Major League Soccer franchise Cincinnati expected to get. Six months later, it’s OK, because it looks like we're finally getting one, too. WCPO’s Jake Ryle was the only local TV reporter who went to Nashville for that city’s announcement last December. He remembers that it didn’t feel like a party or a celebration. The room was packed, he said, but it felt more like a business meeting. Some fans were there, but suits outnumbered shirts and jerseys. Outside, only about a dozen or so soccer fans chanted. It didn't feel like the “big time,” Ryle said. Club officials and politicians filled the stage. The mayor said her words. MLS Commissioner Don Garber made the announcement. "Nashville will be Major League Soccer's 24th team," he said. On the video board, several MLS players congratulated the newly minted franchise. The event was over faster than it started. No after party. The media was quickly shown the door. Ryle talked to Garber that day about Cincinnati’s prospects for the next franchise. "FC Cincinnati had an unbelievable pitch,” Garber said. “They did a wonderful job. I'm confident they're in a really good spot." FC Cincinnati has come a long way since then. The stadium plan is in order. The boxes have been checked. Tuesday’s announcement at Rhinegeist Brewery is a chance to make a statement that Cincinnati means business. Club officials and politicians will make speeches, you can be sure of that. But it’s also a chance to show we mean fun, too. When Ryle talked to Garber at the Nashville event, “The Soccerdon,” as he is known by his Twitter handle, seemed to lay down a challenge for FC Cincinnati fans. "Give them their time in the sun. 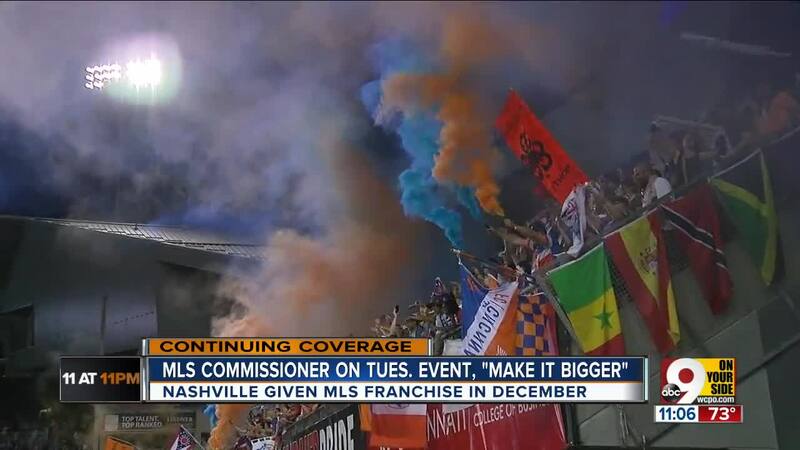 They just happened to be there first,” Garber said about Nashville. 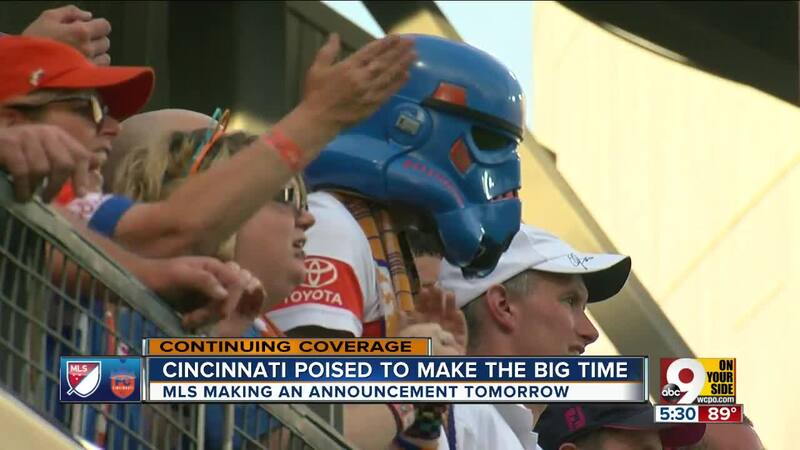 “If that's Cincinnati, I think they'll have as good of an event. Learn from this. Make it bigger." Make it bigger, The Soccerdon said. Now Garber is coming here. Tuesday is our time. The spotlight of the soccer world will be shining on the Queen City. So everybody knows, the event on Tuesday at Rhinegeist brewery is invite-only. And details have been kept hush-hush. But we’ve been assured that fans from FC Cincinnati’s supporter groups – including Die Innenstadt, The Pride, The Legion, Queen City Firm and the Bailey Bast**ds - will be there. After all, It wouldn’t be a party without them. The 5:30 p.m. announcement will be simulcast live at Fountain Square. The party at Fountain Square goes from 4:30 p.m. to 9 p.m.
Who knows, The Soccerdon could make an appearance. He enjoyed making the rounds with fans during a public visit to Cincinnati last year. Emily Stowe, event marketing manager for 3CDC, is in charge of planning the Fountain Square event. Stowe said she expects many other fans to celebrate even if they don't come downtown. You'll be able to watch WCPO’s live coverage of the big MLS announcement live on-air and online at wcpo.com. Also, on our mobile app, our Facebook and Twitter pages, and the WCPO Instagram account.